I kept meaning to make amazing Christmas stockings for the girls last year and of course never got around to it, so they went without (sad face) and instead enjoyed their enormous mountain of gifts. What I should have done is just order one of these beauties from Tiges and Weince. Aren't they great? And they are personalised! I don't think I could do a better job. 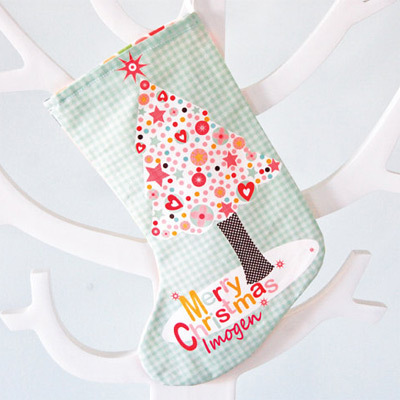 There are also really cute bunting flags and door stops available featuring Kylie's fun Christmas themes. Who could resist. You can find Tiges and Weince in the Etsy and Made It (Australia) stores as well as stockists in Victoria and online. Read more about Melbourne-based Kylie Loy and her Tiges and Weince label here on Bondville. Such a fan of Kylie's work and these are no exception! I love love love everything about Christmas and got so excited seeing these cute stockings.. They are so cute. I made some for my kids last year, very simple, but these are adorable.